The Moeraki Boulders at Moeraki Beach on the South Island of New Zealand. Nature sometimes presents some odds things to human beings. 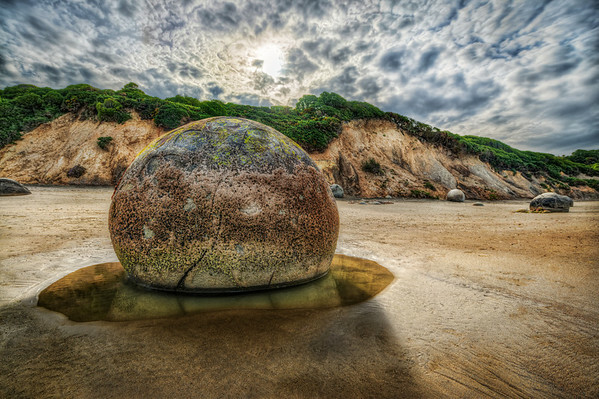 Why do perfectly round boulders come out of the sea, at one particular beach in New Zealand? You can’t help but stand and stare in wonder. I had something particular in mind when I got to the beach. A long exposure to enhance the peacefulness that you experience on a beach, but the light and waves wasn’t right, and I did not get this the way I wanted it. But instead I made the long exposure look even longer, by using some horizontal motion blur. I then also changed the colors, until I got something I liked, and this is the result. As you can see I have cropped the image some. As long as I have enough megapixels, I don’t mind cropping images, if it is an improvement. I would rather come home with a little extra scenery, and crop slightly at home than come home, and lack that last bit. Some believe in getting it right in the camera, but I don’t belong to that school. And as you can see I don’t mind faking colors and long exposure either. I see that as the freedom of the artist. This beautiful aeroplane ‘Etrich Taube’ is one of the few left in the world. It’s the German’s first mass produced war plane and it dates back to before the Great Word (World War I). I saw this in Blenheim on the South Island of New Zealand. Sir Peter Jackson (Director of Lord of the RIngs) has his private collectoin of World War I aero planes stored at the Omaka Aviation Heritage Centre Blenheim. 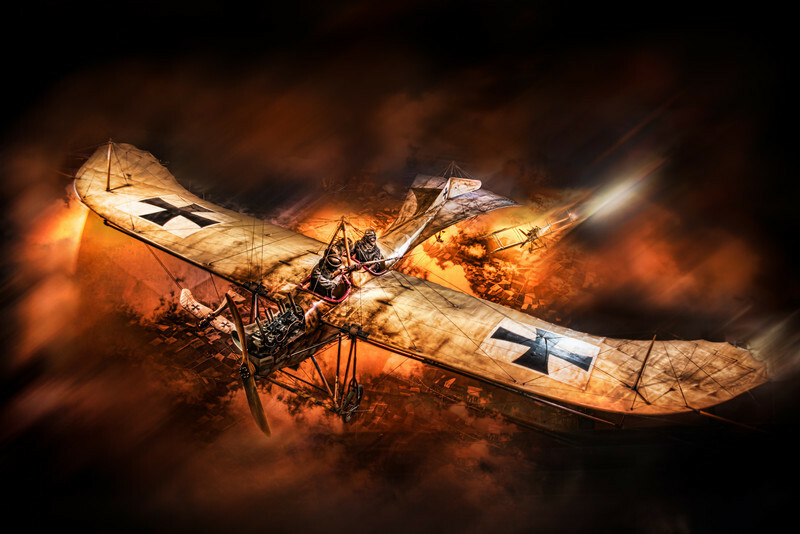 This is one of the first aeroplanes used in war, but you can also find the red baron among a lot of other great planes. What really is impressive, is the way each scene is built up. It’s really amazingly detailed and very natural looking. If in the neighbourhood of Blenheim in New Zealand, don’t miss out on the Aviation Centre. As you can see, the scenery is quite nice, with two extra planes, and a war scene behind, however, the background isn’t large enough to cover the entire hangar. I used a few tricks to make the plane look like in a real war scene. The first thing I did was to tone map my HDR photos, to get the look and feel of the aeroplane. This photo I then put into Photoshop and did a motion blur, in the direction of the plane seems to fly. And this I merged in all around the plane. Having added the motion blur, around the plane, certainly helped removing most of the hangar, but the structure is still visible. The trick now is to make the rest of the hangar go away. And to do this, I start clone stamping some of the ground, at perhaps 25% opacity. The goal is to get all square lines out of the image or at least not noticeable. This proved difficult with only the ground available for clone stamping. The original background contained some clouds and I decided to try to to a cloud texture on the photo, and then mix that in, in exactly the same way as I did with the blur. And now I had the material to start removing the hangar. The important steps, was to remove what gave away, the fact, that the plane hangs inside a building. 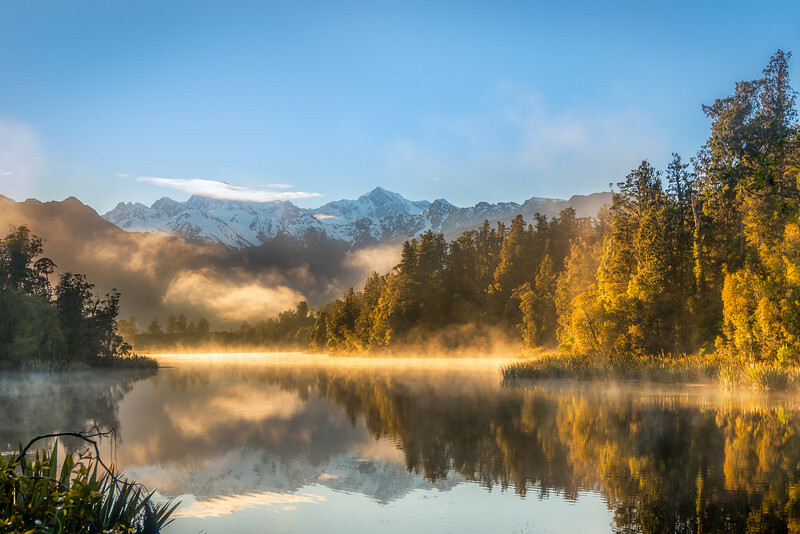 This shot is from Lake Matheson on the south island of New Zealand. It has an exceptional view of Mount Cook reflecting in the lake. My last post was about the photographers plague, where the building you intended to photograph is covered in scaffolding when you get there. This time it was a cloud covering the summit of Mount Cook. Well, it didn’t change the fact that the view and peacefulness at Lake Matheson is absolutely stunning. This particular photo is handheld. The Lake is surrounded with wood and it’s really only a few places that you can shoot and I had to lean out a bit to get this shot. A tripod was no option, and not really necessary either, as it turned out later. I had 9 handheld exposure bracketed shots ranging from -4 to +4. What I tend to do when I get home from a photo shoot is to scan the images for what is usable and unusable. For this I use my homemade collection of Lightroom presets and click through a few. This usually gives me an idea of where a photo can go. Sometimes I stay in Lightroom, do some more adjustments and finish up in Lightroom. In this case one of my presets just made this photo. I tried to do my usual workflow, with Photomatix Pro, but I couldn’t get a result that matched what I got in Lightroom. I even tried out using NIK HDR Pro 2, but that didn’t work out either. After having had the photo lying around for a long time I picked it up again, once more tried the Photomatix, but still couldn’t get anything better than what Lightroom gave me. So instead I finished up the Lightroom version. As I said I used one of my homemade presets. The presets work really well for inspiration, but I usually do some minor adjustsments, because all photos are different. To do an HDR like photo in Photomatix, you have to have a RAW file. If you just shoot in JPEG you will find that you do not have enough information in the shadows in particular. If you have shot a RAW file, like I have done here, you then open up the Shadows and lower the Highlights. You do that by setting Shadows to +100 and Highlights to -100. This results in a bit flat photo, but you can already see that the shadows are not almost black and the bright parts are darker giving a better balance. The next step is to get the the Blacks and Whites adjusted to make the most of the information in the RAW file. You do that by spreading out the Histogram (I will do a post on the histogram later). #1: You slide the Whites slider into the possitive area and keep a good eye on the histogram. You will notice it extends to the right. If you keep moving the Whites to the right you will get blown outs, that is completely white pixels. Usually you don’t want that. In the upper right hand corner of the histogram is a small triangle. If this get’s turned on, you will have blown outs. You can click it to see where or you can press ALT key (command key on Mac) while dragging and you will see the exact spots. You maximize the whites, without getting any blown outs. In this case it’s Whites at +21. #2 Then you do the same for Blacks, except you move it the the left in to the negative area. It’s important to have black in your photo, just not too much. I do this visually and stop when I like the result. Usually I can see that the warning triangle in the left hand corner of the Histogram is turned on. But that’s ok.
#3 This is where the settings are adjusted. The result of this step gives you something that looks HDR’ish, but made in Lightroom. What you den can do is shift around on the Contrast and Clarity until you get something you like and you can adjust all of the other goodies that Lightroom offers. At the end, just remember to check the Whites has got blown outs while you worked the image. As I said I use Lightroom presets quite a bit. I use them to get a good start or to get inspired. I have made my own collection. I am still working on finishing it up, but when I am done, I will make it available to buy from this website. If you are want to get notified when it arrives you can sign up to follow this blog in the lower right hand corner. 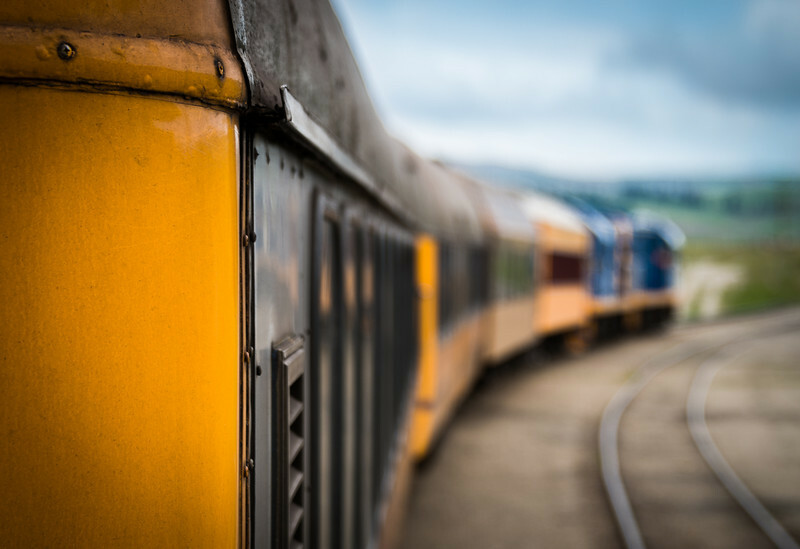 I spend half a day in New Zealand on the Taiery Gorge Railway running through the beautiful scenic gorge, crossing the largest metal construction on the southern hemisphere – a bridge across the gorge. As you can see it is quite tilted. I shot it leaning out of a porch and couldn’t control the camera a lot, because the train was rumbling along and I had to take care, not to fall off. To fix it I first straighten the horizon in Lightroom. That is standard procedure. The second step I took was to get a more symetric look of the train running into the horizon. The warp tool allows you to push things around ind the image. In this case I pushed the train downwards, until I got the symmetry that I wanted. Lake Tekapo in New Zealand is a fantastic place. There is the great big lake, that due to sediments in the lake, has got the weirdest awesome blue color. Then you have the mountain range with snow on top, the largest observatory in New Zealand lies on top of Mount John, with awesome views. And then there is the Church of the Good Shepard. It must be one of the most photographed buildings in New Zealand. The view is fabulous from the windows inside the church. When I shot this photo there was a lot people going around, so I had to wait quite patiently and finally only a few people where in the shot, down by the beach. I then shot my 7 shots of bracketed exposures hand held. I have used the big rocks as foreground and the path that takes the viewer into the church. Behind the church, the lake can be seen. It seems more distant than it really is, and that is because I shot it with a wide angle lens. The church it self points to the lake, and takes the viewer there. This is the before photo and as you can see, it is much more flat and dull. Let’s see what I did to it. This is an HDR photo. I initially shot 7 shots, but I only used the 6. I shot the photo handheld, and the last and brightest image was shaken. I processed the photo in Photomatix pro and saved that image, without closing the output window. I then pressed the ‘Tone mapping’ button once more, this gives a double tone mapped image. This photo I saved too. I then loaded all of the original 6 plus the 2 tone mapped images into Photoshop as layers. Aligned them (Edit->Auto align layers) – Photoshop does a great job of auto aligning, just as Photomatix does. #1: The lake. It looks dull and not even close to the color it really was. I increased the saturation for that particular area and the lake came to life. #2 The photo is taken in the middle of a grey day. Not ideal, but that was the time I was there, and I wanted a shot. To make the photo pop a bit more and make the texture on the church and the rocks stand out, I have used the double tone mapped image for the church and the stones, but also the grass. The double tone mapping makes it more painterly, but it also enhances texture quite dramatically. You can make some really awesome effects from this, however, the first impression, when you press ‘Tone mapping’ is that the photo has gone hay wired. The colors go crazy, so you have to dial back the saturation slider quite a bit, to around 45 (which is neutral). And then the luminosity slider must also go almost all of the way to the left. This is a very potent slider the second time you tone map an image. Find somewhere you like, but be careful not to blow the highlights completely. 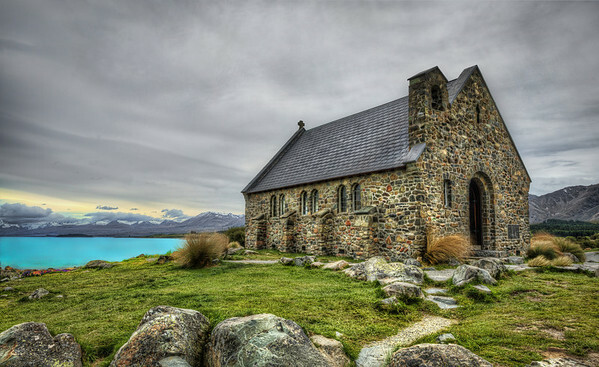 I wanted the double tone mapped image for the church and the rocks in the foreground, and maybe the grass. This is what the church ended up looking like in a 100% crop. Look at all these lovely enhanced texture details with a lot of colors. #3 I didn’t get a shot without people, but by using the clone stamp and content aware fill, I was able to remove the people. I also removed a lot dust spots from the sensor. My camera needs to be cleaned. #4 The grass became crazy green when I double tone mapped it. This is a common problem was grass and trees. Another common problem is that a grey sky usually get’s so full of noise (grain), that it is unusable. The grass is made less green, by duplicating the layer, and then using the Hue/Saturation dialog (CTRL+U) and then select the Yellow color channel and lower the saturation to something more natural looking. You will be surprised to see how much yellow there is in green. I then mixed the more natural looking grass into the photo. The sky, you use one from one of your original shots. #5: I also used the double tone mapped image for the rocks. I also cropped away some of the rocks, to make the path start more elegantly at the bottom of the image. On a beach on the South Island of New Zealand they have these really odd completely round boulders. The are pretty large, about 1 meter in diameter and nobody knows how they were created – one of natures small wonders, like the crawling stones in Death Valley. This is a 9 shot HDR. As you can see the sun is still very very bright. If I had wanted the sun to be less burned, I would have had to use an Neutral Density filter (ND-filter). An ND filter is like sunglasses for the lens. I actually did use an ND filter on the same beach, to take some shots of the moving water behind me. That slowed down my shutter speed to a few seconds making wonderful stuff to the waves. 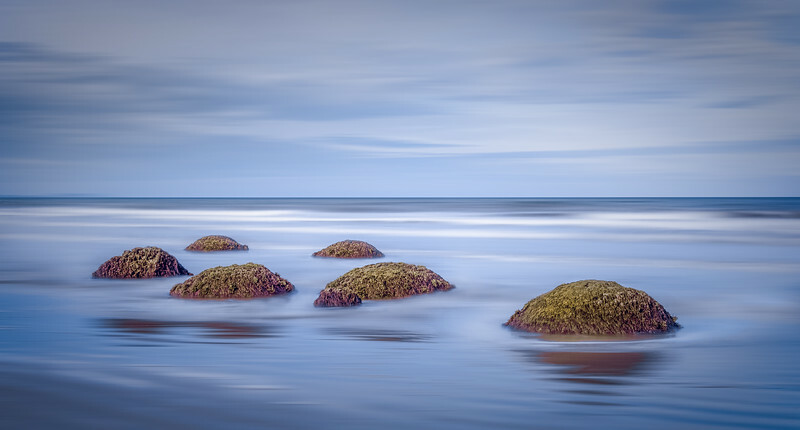 What I did with the composition was to merge in the Moeraki Boulder into the edge of the sand cliff, but made sure not to place it above the trees, so it merges into the edge between the sand cliff and the trees on the top of the sand cliff. That gives three repeating shapes, that looks a bit like three waves. I have spend a lot of time making this photo. My aim was to get something that looked Classic HDR, and I wanted a strong shadow cast by the boulder. I have used the edges of the shadow as lead in lines. The reflection in the water I made sure was bright to make a bold reflection. And the last thing I did was a lot of clean up. I have really realized how much cleaning up my photo affects the impact of the photo. I decided to clean up small rocks, leaves etc and it really became a much better photo. One of the things you have to keep in mind, when you take photos, is to keep it simple. To many things in your photo, will just confuse the viewer and it will be like noise for the viewer. Rubble, stones, leaves etc creates a noise too, so either clean up the scene before taking it or do it in Photoshop later. Try at least cleaning up in the foreground of your photo, and be amazed how it affects the impact of your photo. 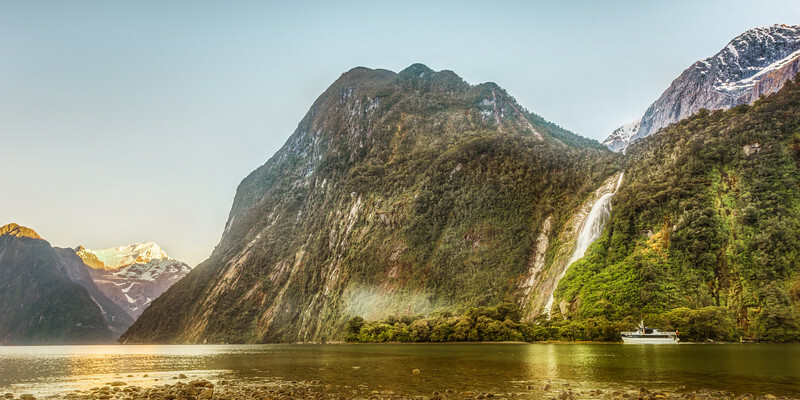 One of the most beautiful and dramatic fiords lies on the the west coast of New Zealands South Island. The sun rises and shines on Mitre Peak, which rises an amazing almost 1700 m straight out of the water, which I was told was the record. 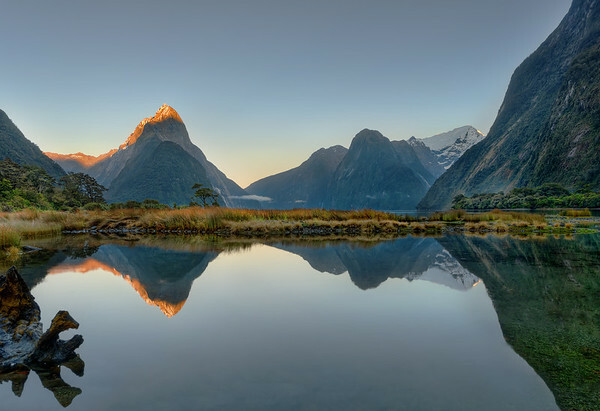 The weather changes a lot in Milford Sound and seeing it without a cloud is a rare experience. It rains up to 11 meters (!) per year here, which is makes this place one of the places on Earth where it rains most. This is 7 shot HDR photo merged together using Photomatix. I have worked a lot with the image. Created a new layer, fine tuned an area, and then blended that area into the main photo, then made another duplicated layer to optimize another area. I have used Topaz Adjust and Nik Color Efex filters with delicacy. I have done a lot of cleaning up in the photo. There was a lot of dirt, leaves, insects etc in the water. This I have removed using the clone tool in Photoshop. It took some time, but it’s important to achieve the calm mood of the photo and the strong clear reflection. Our last real drive after a month in New Zealand went from Oamaru to Lake Tekapo. 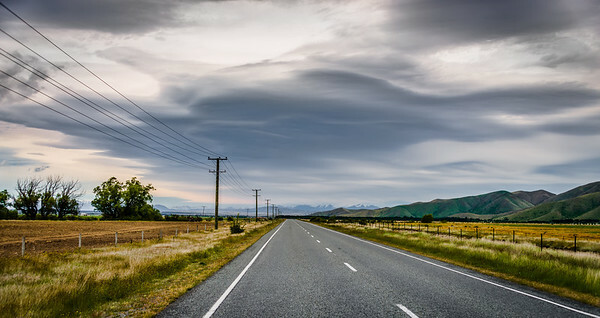 This is from the road to Twizel and suddenly we saw these amazing clouds. I have never seen clouds like that in Denmark. We saw them a couple of times down there. This photo is 95% Lightroom processed. I have placed a gradient on the sky, enhancing the contrast and clarity, as well as bringen the exposure down a bit down. Then I have on a global basis turned up the contrast to maximum, and set the clarity to +29. Shadows I have raised to the maximum, and the highlights I have lowered to the minimum. The Curves I have on the minus side (-13, -9, -22 and -44). This is a very strong manipulation, but it is what gives the photo its look and feel.